Is China Now Rolling in Reverse? 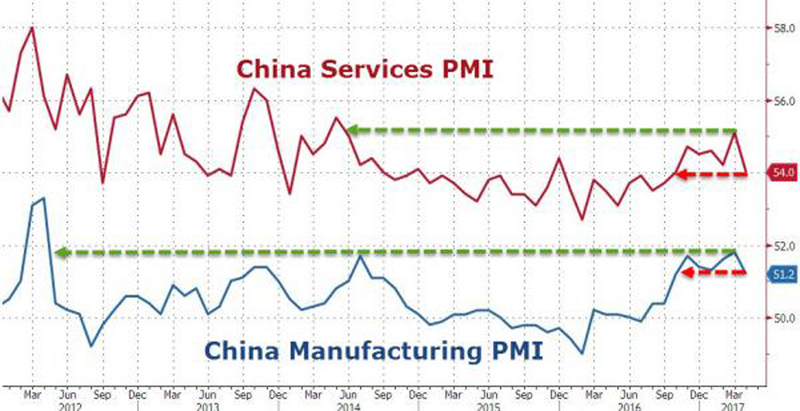 The New Orders component in last week’s Purchasing Managers’ Index (PMI) reports on the Chinese economy tumbled to their lowest levels in at least 6 months. So what, you may ask? These downbeat reports came despite Q1’s record surge in new credit creation. Hold onto your seats, folks. 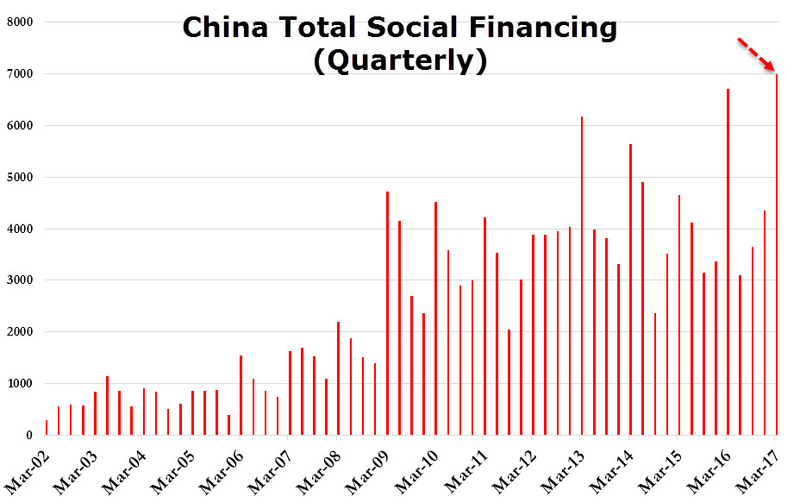 In the first quarter, credit growth (Total Social Funding or TSF as China calls it) reached a new record high of 6.93 trillion yuan – equivalent to the size of Mexico’s economy – and well above last year’s first quarter total. At today’s Yuan exchange rate, China’s credit creation in Q1 amounted to just over 1 trillion U.S. dollars. Astounding. Since then, PMIs have plunged from multi-year highs to six-month lows… and the decline is broad-based. Something is very wrong in China. 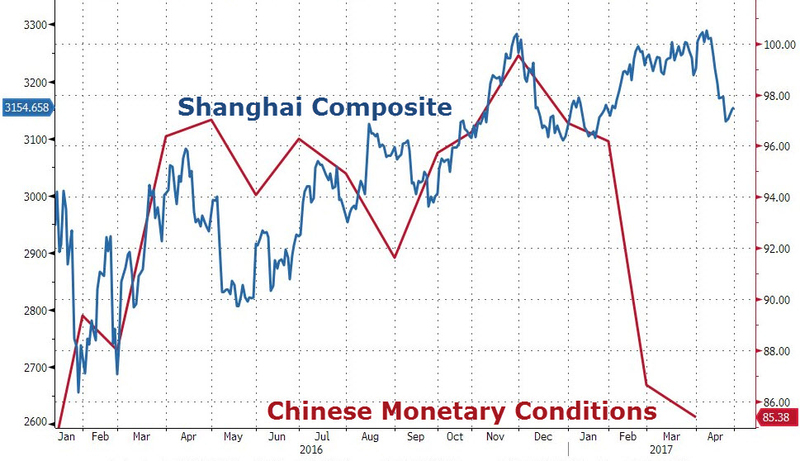 The global engine of reflation has hit a wall and that’s reflected in the Chinese equity markets. After years of astounding expansion, China now has the world’s four largest banks (by assets). But the reason is not sound economic growth, it’s the world’s largest Credit Bubble fuelling epic mal-investment and fraud. Here is what systemic fraud looks like, Chinese style. On April 24, Bloomberg reported that rising defaults in China are unearthing hidden debt at companies across the country. For years, firms that couldn’t get loans by themselves have been winning banks over by getting other companies to guarantee their borrowings. The companies making those pledges do not include them on their balance sheets, leaving creditors in the dark. Borrowers often extend the guarantees for each other, raising the risk that failures could be cascading dominoes at a time when increasing borrowing costs have already added to strains. China’s banking regulator has ordered checks of such cross-guaranteed loans. I’d say it’s a little late. Yesterday, Hayman Capital’s Kyle Bass, a very smart China investor, was interviewed on Bloomberg and warned that “all hell is about to break loose”. He sees a liquidity crunch underway. The immediate problem is with so-called Wealth Management Products (WMP), essentially leveraged money market funds that banks and other lenders use to raise money. WMPs have become a key part of the Chinese financial system, accounting for more than $4 trillion in funding to a $34 trillion banking system. In April, issuance of WMPs fell 15% from March, squeezing the financial system out of much-needed liquidity. Just another one of those little problems the markets have been ignoring, dear reader. This one could get very interesting very fast. Get your helmet just in case. Next Next post: Major Move Coming?